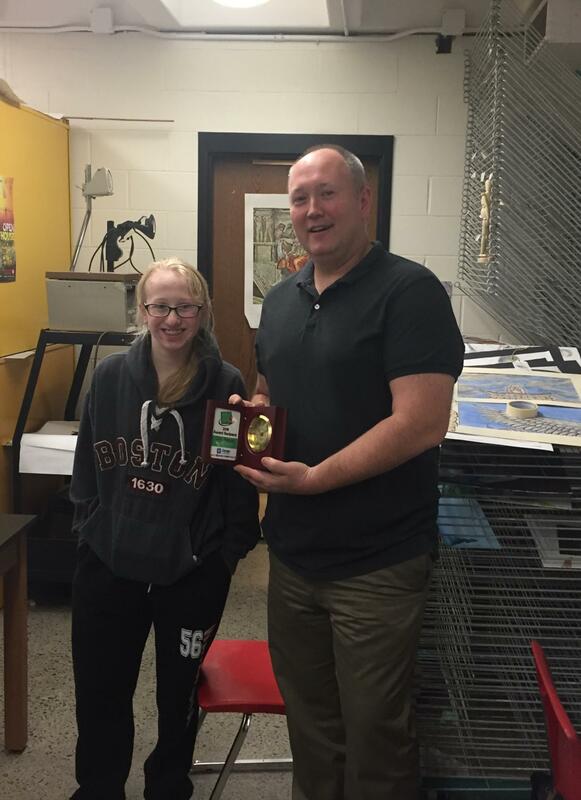 Newark Valley High School Studio Art Teacher, Chris Negus was honored with the 'Apple for the Teacher Award,' by the Cayuga Radio Group. Negus was nominated by ninth grade student, Piper Davis for his dedication and ability to teach difficult concepts with ease. Congratulations Chris Negus. I would like to nominate Mr. Chris Negus from Newark Valley High School for the Apple for the Teacher Award. Mr. Negus is my Studio Art teacher and was my eighth grade art teacher. He is also one of the advisers for our art club, an after-school program which he does in the little spare time he has. Mr. Negus is very good at what he does and was able to teach me so much about art in just 10 weeks last year. He has helped me build a passion for art and is always willing to advise me on my artwork, even when I was not in his class. Mr. Negus teaches me advanced techniques simply, so I can understand it and create nice art work. My abilities have grown so much in a year- from ‘not-so-good’ cartoon figures to a Best in Show children’s book and third place self-portrait at our school’s art show. Not only is Mr. Negus an incredible art teacher, but he also has an outstanding sense of humor and so much kindness in his heart. He is mild mannered, and I have never seen him without a smile. He helped put me on a path to pursuing my dreams and I am so appreciative of that. Every year for Art Club, he and the other art teacher, Mr. Taylor, plan an amazing trip for the students to go to New York City to see Broadway shows and to see the miraculous MET museum. That is only a smart portion of the reasons why my art teacher, Mr. Chris Negus, should win a spot in the Apple for the Teacher Awards Thank you. I rest my case, your honor!